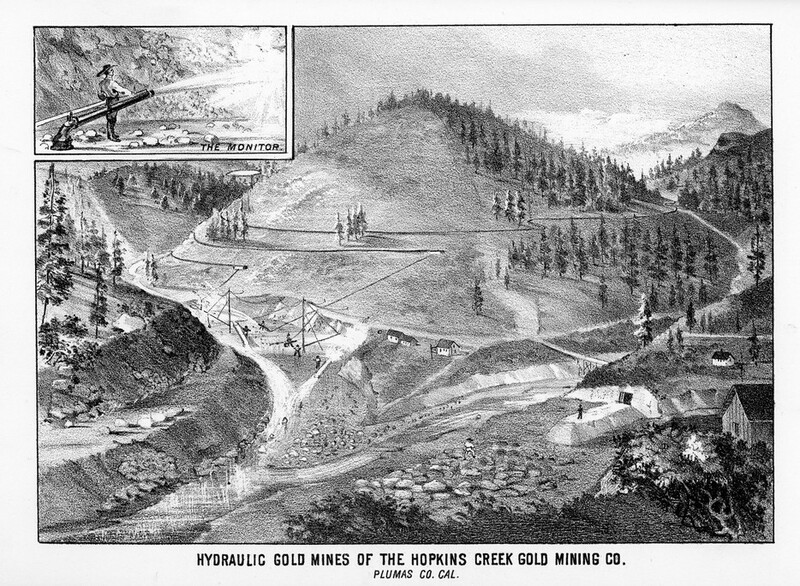 During the California Gold Rush, early exploration of the Middle Fork of the Feather River yielded rich gold deposits along the tributary that became known as Hopkins Creek. Mining along Hopkins Creek started soon after – at around 1850. This mining created at least two small communities named “Forks of Hopkins” and “Hopkinsville.” Currently, it is believed that “Forks of Hopkins” existed from approximately 1853 into the 1880s, while “Hopkinsville” is believed to have existed from around 1850 until sometime around 1860. Little is known about the businesses that thrived here, nor about those individuals who made up these communities. There were numerous mining claims along the creek, and some associated graves. Nevertheless, the communities and mines left few historic records. It is hoped that documenting the archaeological remains will lead to a better understanding of the early Hopkins Creek mining history. This area of the Plumas National Forest is rugged and steep, and no previous archaeological surveys have been performed to record these early communities and gold mines. This year’s focus will be on finding and recording the small community of “Forks of Hopkins” along with any evidence of the gold mines that are thought to still be present. PIT volunteers and FS staff will work in small groups to survey the land along Hopkins Creek to find historic sites. Once a site is found, volunteers will help archaeologists document the remains. A variety of equipment will be used including metal detectors, Trimble GPS, and digital cameras. We hope you’ll join us this summer as we look into the mystery of the establishment – and disappearances – of these boom towns, their occupants, and the towns’ histories!